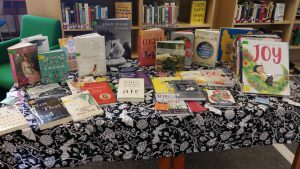 This week, as we do every week before break, we hosted a Breakfast and Browse. It’s our chance to welcome the teachers in to get their books for their holiday, to showcase our newest titles and features, and to celebrate reading with snacks. This B&B, we also had a Wellness Table, with all sorts of books for people looking to get into spring and out of the winter. With exams around the corner, stress seems to be a part of many people’s lives, and this is our way of presenting some of our resources to help. We’ve been updating our mental health collection and making purchases to enhance those resources. 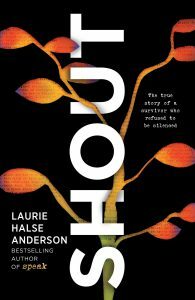 Speaking of mental health, K just read Shout, the newest book from Laurie Halse Anderson. We are bringing Laurie Halse Anderson in December, and this new book is her memoir in poetry. It’s heartbreaking and beautiful and honest, and worth a read for any person. Any more would ruin it, but you can find it in the novels and verse section. This entry was posted in Events, What We're Reading by Kelsey Hedrick. Bookmark the permalink.